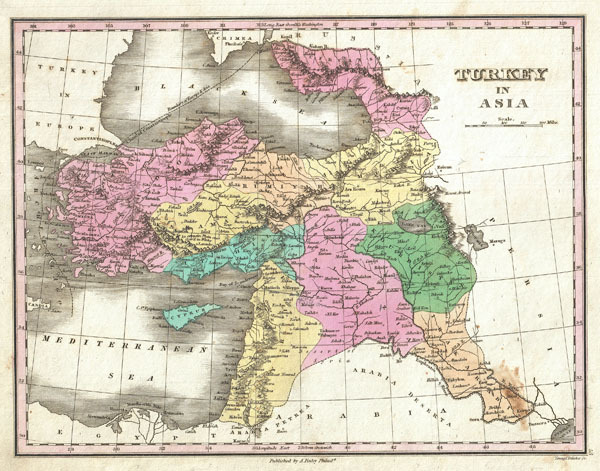 A beautiful example of Finley's important 1827 map of Turkey in Asia. Covers the lands claimed by the Ottoman Empire in the early 19th century. These include the modern day nations of Turkey, Georgia, Iraq, Lebanon, Syria, Jordan, Cyprus, Palestine and Israel. Shows the boundary between Europe and Asia. Offers color coding at the regional level. Title and scale in upper right quadrant. Engraved by Young and Delleker for the 1827 edition of Anthony Finley's General Atlas. Very good condition. Minor discoloration lower right quadrant. Original pressmark. Blank on verso. Rumsey 0285.054 (1831 edition). Phillips (Atlases) 4314, 760, 752, 6045.